Our company performs Bertazzoni convection steam oven repair. Convection steam ovens are the latest invention in the modern kitchen. They combine convection baking, grilling, and steam and delivers the healthiest and most flavorful cooking results. Bertazzoni makes one of the best and most efficient convection steam ovens on the market. We know everything there is to know about Bertazzoni appliances. Our technicians are all factory trained and certified. 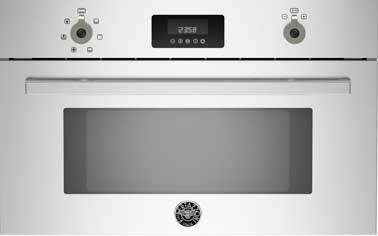 They are up to date with all the latest kitchen appliance technology including convection steam ovens. We can get you genuine Bertazzoni parts and expertly install them for you. All you have to do is give us a call, and your convection steam oven will be repairing in no time at all. Customer satisfaction is guaranteed! Bertazzoni is a leader in modern, high quality and technologically advanced appliances. They produce a wide variety of kitchen appliances, and convection steam oven is just the latest and the greatest in its lineup. It is crafted in Italy to the highest standards of appliance manufacturing. This kind of oven combines both baking, grilling and steaming to produce amazingly moist and flavorful food. Using water-generated steam in the cooking cycle in addition to convection helps to maintain balanced moisture in the food while sealing flavors and vitamins. Because it is so well crafted this kind of oven can last you a lifetime. But for the same reason, you need to take special care of it. That is why you need someone who knows everything about Bertazzoni to do repairs and maintenance for it. We are such a company. We have the skills and knowledge needed to keep your Bertazzoni appliances working for a long, long time. Our customer service is one of the best. We offer you accurate estimate with every job and FREE service call with all repairs. The parts we order are always of the highest quality and have a 3 yearwarranty on them. We schedule flexible appointments and work around your schedule. But most importantly our team members are always polite, respectful and ready to help. We will make your appliance repair appointment convenient and fast. Give us a call or fill out this short contact form and we will be right on the way to helping you out with your Bertazzoni convection steam oven repair. Our team will give you a convenient appointment and get to work on ordering parts for you. We often preorder to expedite the whole prosses for our customers. A skilled Bertazzoni technician will be on his way to your house. He will examine your steam oven and will determin what needs to be done. Usually what you will need will be a part replacement and overall tune-up of your appliance. Our tech will do the job fast and accurately. We are always very detail oriented. Your convection steam oven will be fully functional after we are done with it! Why choose us to do Bertazzoni convection steam oven repair for you? We have 30 plus years of experience doing Bertazzoni convection steam oven repair as well as other brands. Our team is all highly skilled and educated about deluxe, European brand appliances. In fact, they are all factory trained and certified. We do our work well, and we keep our customers satisfied. We provide a fast and convenient appointment. And the results speak for themselves. Your Bertazzoni will be working as good as new! For Bertazzoni convection steam oven repair, please call us at 925-265-7782 in East Bay or 628-214-0064 in Marin County. Or you can fill out our short contact form. We would love to talk to you and answer all of your questions. We perform professional Bertazzoni microwave repair and maintenance. Our team is factory trained and certified. It does not matter what model of Bertazzoni microwave you have, we can repair it for you. In fact, we repair all the Bertazzoni kitchen appliances. We know everything there is to know about Bertazzoni. Our technicians learn about the new technology as soon as they come out. We can quickly diagnose what the problem is and find the best solution for it. We will order genuine Bertazzoni parts for you and will professionally install them. After a visit from us, your Bertazzoni microwave will function great! Bertazzoni is an Italian manufacturer of technologically advanced, well designed and highly functional kitchen appliances. The appliances are made for luxury and performance. For example, the combi-microwave oven is versatile and easy-to-use, with a family-sized capacity and six microwave power levels. It is designed to cook grill and microwave your food to perfection. Your Bertazzoni appliances can last a lifetime if they are well taken care of. If you do have a problem with it, you best choice is to call a Bertazzoni repair professional. We are such professionals. 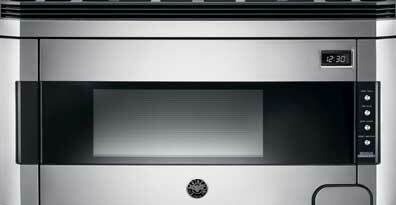 We know Bertazzoni microwaves from A to Z. We are precise and detail oriented. So, you can be sure your combi-microwave is in good hands. Besides being number one Bertazzoni repair specialists, we are also number one in customer service. We always treat our customers right. Our company provides you with a accurate estimate with every job and FREE service call with all repairs. Our appointment scheduling is geared towards our customers. We have same day appointments available and will work around your schedule. Also, we have access to Bertazzoni genuine parts and very reasonable prices. And we offer a 3 yearwarranty on those parts. We strive to make every repair appointment fast and convenient for you! Call us for all of your Bertazzoni microwave repairs needs. One call and we will schedule a convenient repair appointment for you. Our technician will pick up the parts for your particular project and will be ready to start the work right away. As soon as he gets to your house, he will diagnose your microwave and figure out the best plan of action. He will expertly install the parts that are broken and worn down and test your microwave to make sure it’s working fine. The result will be a fully functional Bertazzoni microwave. Why choose us to do Bertazzoni microwave repair for you? We do an excellent job when it comes to Bertazzoni microwave repair because we have the experience and the knowledge. Our technicians are factory trained and certified. When it comes to European deluxe brands such as Bertazzoni only precise and professional work will do. And that is what we strive to achieve. Genuine parts combined with expert installation makes every project we work on successful. We guarantee you that your Bertazzoni microwave will be as good as new as soon as we are done with it! For Bertazzoni microwave repair, please call us at 925-265-7782 in East Bay or 628-214-0064 in Marin County. Or you can fill out our short contact form. We would love to talk to you and answer all of your questions. We specialize in Bertazzoni warming drawer repair. If you warming drawer is malfunctioning or if any on of your Bertazzoni kitchen appliances is broken we can help. We repair all Bertazzoni models including ranges, refrigerators, warming drawers, cooktops and much more. Our technicians know Bertazzoni brand from A to Z. In fact, we have more than 30 years experience repairing all the European brand appliances such as Bertazzoni. With so much experience you can be sure that we will do grat job for you. In fact, we can correctly diagnose your broken appliance, find the right Bertazzoni brand parts for it and do a professional installation. We will troubleshoot your warming drawer until it is working. After an appointment with one of your skilled Bertazzoni repair specialists, your warming drawer will be as good as new! Bertazzoni manufactures top notch kitchen appliances. They are extremely innovative and very durable. For example, the Bertazzoni Professional Series warming drawer can warm up your food or keeps your food warm prior or during the meal. It is a welcome addition to any professional kitchen. And your warming drawer can serve you for a very long time. But if it brakes you need to higher a professional company for repairs. We are such a company. We know how to quickly find the problem and fix it once and for all. We will also help you with maintenance. Our company is one stop show for all of your Bertazzoni repair needs. Besides having a lot of experience in all things Bertazzoni, we also offer excellent customer service to our clients. Our team is always respectful, highly professional and ready to help. We provide a accurate estimate with every job and FREE service call with all repairs. Our prices are very reasonable, and certainly, it’s always cheaper to fix your Bertazzoni appliance rather than buy a new one. We can get you high-quality Bertazzoni parts at below market value prices as well. We are so sure of their quality that we offer a 3 yearwarranty on all of them. Give us a call, and we will take care of your broken warming drawer. We will schedule you an appointment with a qualified warming drawer repair specialist. Our team will start by preordering all the parts necessary for your appliance. Technsihen will be on his way as soon as he has the parts. He will have all the necessary equipment and tools with him. He will start working on the warming drawer right away by determining what the problem is and finding the best solution. Usually, the process involves a lot of troubleshooting, cleaning parts and replacing certain broken parts. Our technicians work fast because they know what they are doing. Before you know it your project will be done. Our specialist will present you with a perfectly functional warming drawer. You will be happy with the results you get from us! When you have an appliance as valuable as Bertazzoni, it’s very important to keep it well maintained. Changing filters and the rest of upkeep is very important. You might want to hire a professional to do it for you on an annual or bi-annual basis. Our company offers such maintenance program. This program covers all appliances in your kitchen and laundry. As a part of this program, our technicians will do all the maintenance for you on a regular basis. They will inspect your appliances every time and catch any problems before they become significant. This maintenance service will save you time and money in a long run. Why choose us to do Bertazzoni warming drawer repair for you? You have to choose us to do your Bertazzoni warming drawer repair because we are fast, reliable and experienced. Our technicians have certifications in Bertazzoni repair. They are up to date on the latest appliance repair technology. They know everything there is to know about Bertazzoni brand. We treat all of our customers right and will do the best job possible repairing and doing maintenance on their appliances. You will be more than happy with our skills and with our friendly and helpful customer service. Your whole appliance repair experience will be convenient and fast. We guarantee it! For Bertazzoni warming drawer repair, please call us at 925-265-7782 in East Bay or 628-214-0064 in Marin County. Or you can fill out our short contact form. We would love to talk to you and answer all of your questions. We do Bertazzoni ventilation repair. If your Bertazzoni ventilation hood is broken we can help. We specialize in all things Bertazzoni. Our technicians are all highly trained professionals and they know everything there is to know about this European brand. No matter how big or small the problem is we will be to find a solution. We will diagnose you ventilation, order the parts and install them for you. Before you know it your Bertazzoni ventilation will be working as good as new. Bertazzoni makes top notch kitchen appliances including ranges, ovens, refrigerators, cooktops and much more. They also make very functional and high-quality ventilation hoods. Those hoods can be installed under a cabinet or on the wall and match perfectly with Bertazzoni Professional Series ranges and cooktops while also complementing other Bertazzoni Series. We are Bertazzoni brand specialists and will help you with all of your repair, installation and maintenance needs. We can take care of any of your kitchen appliances including Bertazzoni ventilation repair. Besides being number one in Bertazzoni appliance repair, we also offer excellent customer service to your clients. For example, we provide accurate estimate with every job and FREE service call with all repairs. Our shceduling is flexible, and we will work around your schedule to make service appoinment convenent for you. 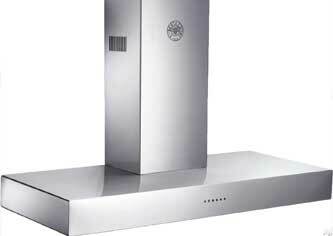 We also preorder genuine Bertazzoni parts and try to come to every applaice repair appoiment with parts on hand. Our parts are of the highest quality, and we have 3 yearwaranty on them. Top Home Appliance Repair team is not only highly skilled but is also polite, friendly and helpful. We value our customers and always do a great job for them! As soon as you contact us, we will arange a conveneint service appoinment for you. Our hihgly qualified technician will be on his way to your house read to do Bertazzoni ventilation repair for you. As soon as he gets there, he will get to work and figure our what the problem is. Often what you need is cleaning of the filtters or the internal parts of the centilation system. Sometimes parts will need to be replaced. What ever it is, we will do it. At the end you will get perfectly functional and safe Bertazzoni ventilation. You will be more than happy with our service, and you ventilation unti will serve you for many more years to come. Why choose us to do Bertazzoni ventilation repair for you? Our company Top Home Appliance Repair specializes in European and high ticket item brands such as Bertazzoni. We know everything there is to know about Bertazzoni ventilation repair. With more than 30 years of hands on experience you can not find anybody more knowledgeable and experienced then us. Our technical team is up to date on all the latest Bertazzoni appliance intovations. In fact, they are all factory trained and certified to do those repairs. You will be impressed with both our technical skills and our outstanding customer service. We will treat you with respect and give you great resutls. Call us and your Bertazzoni ventilation system will be as good as new. For Bertazzoni ventilation repair, please call us at 925-265-7782 in East Bay or 628-214-0064 in Marin County. Or you can fill out our short contact form. We would love to talk to you and answer all of your questions. Our company performs professional Bertazzoni dishwasher repair. We are specialists in all Bertazzoni appliances including ranges, ovens, cooktops convection ovens and of course dishwashers. Our technicians have the skills and knowledge to repair any model of Bertazzoni both old or new. They are factory trained and certified. No project is too small or too big for us. So, if your dishwasher is having issues such as not draining, not cleaning properly or making noise, we are here to help. We will come over and thoroughly examine your appliance. We will figure out the best action to take and get right to work. Before you know it your Bertazzoni dishwasher will be working just fine. Customer satisfaction is guaranteed. Bertazzoni makes some of the most efficient, high quality and functional dishwashers. For example, Bertazzoni dishwasher XT model offers superb cleaning performance with four water sprayers, which include a high-pressure rotating sprayer arm to remove hardened deposits. This top-of-the-line dishwasher is perfectly insulated and extra–quiet with only 45 Db. Energy Star compliant with 249 kW/year. 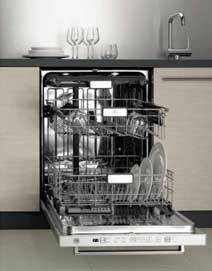 With right maintenance, your dishwasher can last you for years without giving you any problems. But sooner or later you will need it serviced or repaired. Our company has more than 30 years experience repairing European brand appliances. We can do a great job on your Bertazzoni dishwasher. Besides giving you professional Bertazzoni repair, we also offer you some of the best customer services ever. We make sure that your appliance repair appointment is fast and convenient! Our team is always respectful, friendly and helpful. We work around your schedule by providing you with a flexible schedule. All of this plus accurate estimate with every job and FREE service call with all repairs. And of course, we can get you genuine Bertazzoni parts for your dishwasher very fast. Those parts are under our 3 yearwarranty so you can be sure that whatever we install will last you a long time. Give us a call, and one of our customer service representatives will schedule you for a convenient and easy maintenance appointment. Our technician will gather all the information from you and will preorder the parts. As soon as we get the parts, we will be on our way ready to repair your dishwasher. Our technician will start troubleshooting as soon as he gets in. He will quickly determine the problem and figure out the best solution. He will install the new parts and dispose of the old once. We work fast because we know what we are doing. At the end of it, you will get a perfectly functional and clean dishwasher. We work to please our customers! Why choose us to do Bertazzoni dishwasher repair for you? We should be your top choice in Bertazzoni dishwasher repair because we have all the experience and skills. Our company Top Home Appliance Repair has been in business for more than 30 years. And all of this time we have been working or repairing European, high ticket item appliances. We know everything there is to know about Bertazzoni brand. In fact, we are factory trained and certified. Bertazzoni is a unique brand on US market so not every appliance repair shop knows how to handle it. But we do. And we can assure you that your Bertazzoni dishwasher is in good hands. From diagnostics to ordering parts, to installation to final check up we do a thorough job on everything. We will make sure that your Bertazzoni can serve you for a long time without breaking again. For Bertazzoni dishwasher repair, please call us at 925-265-7782 in East Bay or 628-214-0064 in Marin County. Or you can fill out our short contact form. We would love to talk to you and answer all of your questions.